We’ve been lucky to have some new bling in the studio thanks to Poisonberry Jewelry! 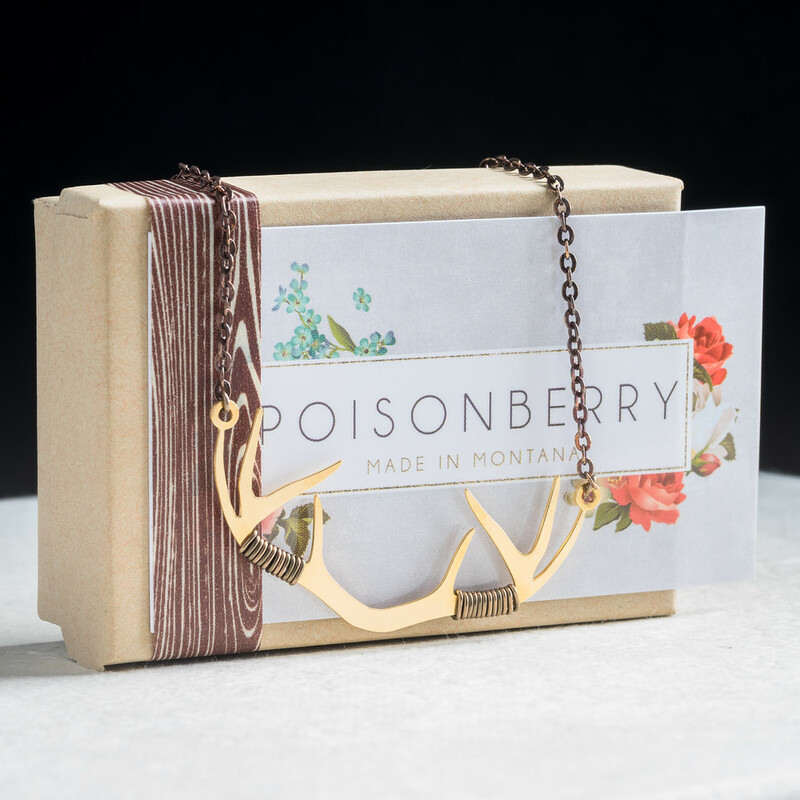 Poisonberry is a cool Montana made jewelry brand and Katie came by to help show off the gold My Deer pendant. This is a new piece that’s part of Poisonberry’s Spring/Summer 2015 line. Check out the whole line at http://poisonberryjewelry.com and follow them on facebook and instagram to stay on top of the latest jewelry fashions. Thanks to Katie for always making any wardrobe look good! 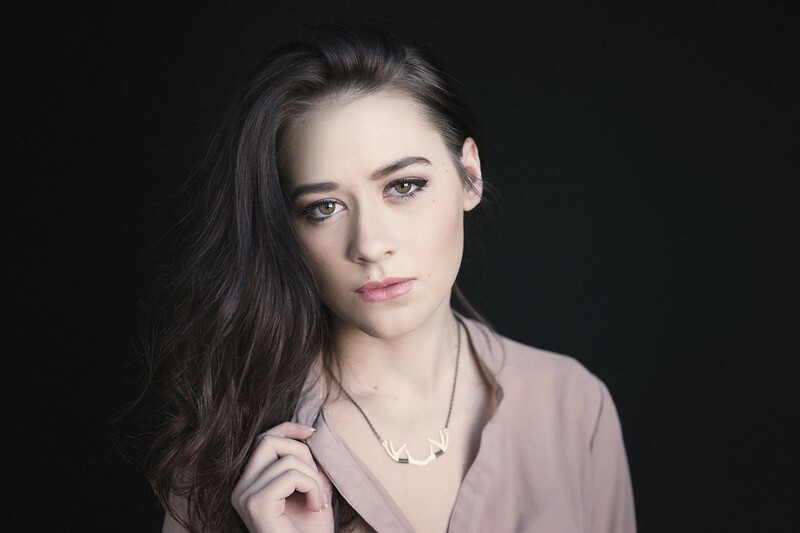 Katie needed some new headshots and we needed to show off a necklace so it was good timing to achieve both. I am really enjoying the horizontal and square crop headshots these days. The photo of Katie is lit with natural light from a large window camera right and two white 4x8 foot reflectors camera left. The background is a black wall and there is a tiny bit of window light falling on it to give just a touch of separation between the Katie and the background. I am really lucky to have beautiful North facing windows, the preferred light of artists for generations. I recently read in Irving Penn’s book “Small Trades,” that he was obsessed with North light studios and I observed from some of the photos in the book that he used flags to control the light on the background. The point of a flag is to block the light, or “flag the light,” and they can be made out of anything that will block light. I use painted black Styrofoam for my flags, but you can also purchase flags that mount on a lightstand for perfect control. I’ve used them before on c-stands and they are quite nice. Irving Penn used a board propped against a stool. The second photo is also lit with natural light and a reflector in a similar manner as the portrait, but the curtains on my window are partly shut, creating a smaller and therefore harder light source. It looks very similar to studio lighting and by controlling the size of the window light it’s very easy to make natural light look like studio lighting. The only problem with natural light, as opposed to studio light, is that the only way to make it brighter is to open the curtains up. But then I can’t control the size and therefore the quality (hard or softness) of the light. If I want to make the light harder by closing the curtains down, I lose a lot of the light. So unfortunately with natural light, controlling the quality of the light also affects the quantity of light (brightness). With studio lighting I can control both the quantity and quality of the light separately. That being said, I don’t have any studio lighting modifiers that are 20 feet wide and 10 feet tall like my beautiful North facing windows!